2 of 2 In a large pot, bring 8 cups of lightly salted water to a boil. Add cauliflower; cook 2 minutes. Add broccoli; cook an additional 6 minutes or until vegetables are crisp-tender. Drain. 1 of 2 In a medium-size saucepan, melt butter over medium heat. Whisk in flour and cook 1 minute. Gradually whisk in the milk; continue to whisk until smooth. Bring to a boil. Remove from heat and stir in cheese, mustard, chiles, hot-pepper sauce and salt. Stir until smooth. If a thinner sauce is desired, stir in a few more tablespoons of milk. 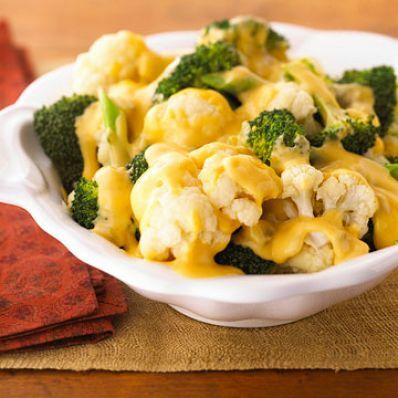 2 of 2 To serve, place vegetables in large serving dish and pour cheese sauce over the top. Serve immediately.